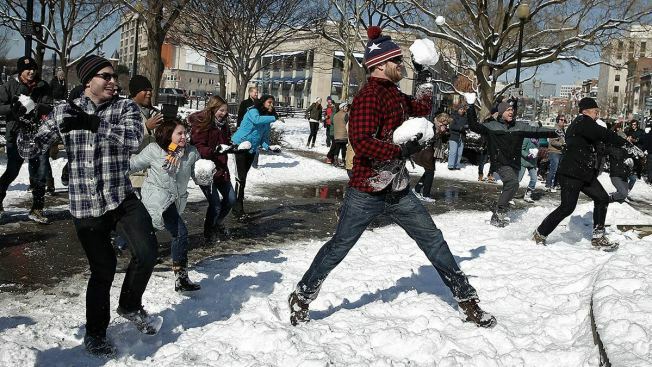 Join the D.C. Snowball Fight Association as it takes on the weekend blizzard for a snowball fight in Dupont Circle Sunday morning. This storm's fight is named "Snow Wars: The Snowball Strikes Back," a play on "Star Wars." Attendees are encouraged to dress as their favorite Star Wars or space-themed character. The battle was originally scheduled for Saturday but was pushed back to Sunday at 10 a.m. due to safety concerns during an intense snowstorm. Since Metrorail and Metrobus service will be suspended through the weekend, the snowball fight is expected to be attended more by those within walking distance of Dupont. The Snowball Fight Association said it hopes to organize another big event once Metro services are operating or on a future snow day. Following the fight, Ping Pong Dim Sum of Chinatown will host the official after party, where awards for best Snow Wars outfit will be presented. Winners will receive redeemable vouchers for food and drinks.